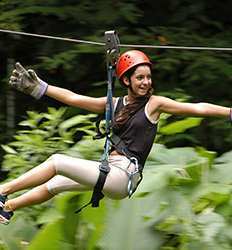 You cannot say that you have vacationed in Costa Rica until you experience the quintessential Costa Rica canopy tour. What better place to zip through canopy and swing through the trees like Tarzan than near the world-renowned Manuel Antonio National Park. 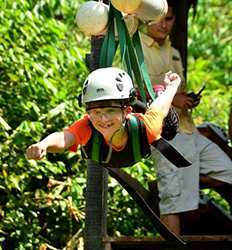 Our Manuel Antonio canopy tours are great for the whole family! The Real Deal Tours offers you a wide range of canopy tours in Manuel Antonio, from the traditional 18 platform canopy adventure to a unique Superman zipline or canopy & ATV combo tours. 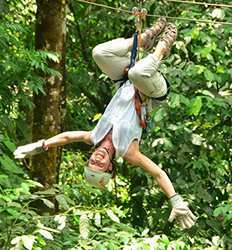 Those who need more action than to just lay on the beach while on vacation will enjoy the thrill of flying through the canopy treetops and enjoying a bird's eye view of all the flora and fauna that call Manuel Antonio home. We provide round-trip transportation and friendly Tico smiles from our bilingual guides who will make sure you understand all safety instructions before soaring through the jungle. Canopy tours in Costa Rica are all about fun after all. 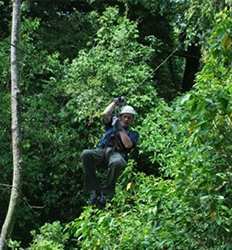 Below you will find a list of the various Manuel Antonio canopy, canoyoning & rappel tours available in this region. Book your discounted canopy tour with us and know you are getting the best deals in Costa Rica on the best canopy tours in Manuel Antonio! Our Canopy tour begins with a drive through the rainforest to the canopy site in Quepos, located approximately forty-five minutes from Manuel Antonio National Park in Paso Real. The canopy consists of 18 platforms, 10 zip lines, 2 rappel lines, 1 suspension bridge, 1 Tarzan swing, a butterfly farm & a serpentarium.